As you may be able to tell, I'm back from our quick, Thanksgiving jaunt. I packed up five orders today and they'll all be going out Monday to their new homes. I spent some time shopping around Etsy today, and decided to go for two eggs from SwedishDesign. I got a Santa and a Snowman, and I can't wait to get them! They're wonderful illustrations and will make excellent gifts for my sets of parents. I spent a lot of time going through some incredible work by several very talented egg-workers, for lack of a better term. I thought I'd share some of these amazing creations with you. 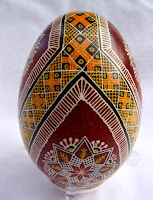 Here's a wonderful pysanka ornament by doreseggs. The colors and patterning are captivating. This artist, PysankyPanky, has too many incredible pieces to pick a favorite from, but this one is at the top of my list! Here's a little wonder by 1eggman. 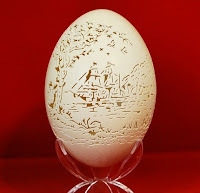 This artist has the most amazing carved eggs I've ever seen! 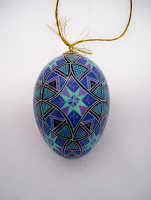 Check out my favorite items and favorite sellers for more incredible egg artists!